When we decided to follow the call of missions and sell everything we own and move to Ecuador, I only had trouble parting with one personal item: my kitchen table. I couldn’t verbalize the attachment that I had to it, but every time I thought of sending it off in the back of someone’s truck, I got sad. Eventually, the table did find a new home and I let it go freely but still not understanding exactly why I wanted to keep it. I can’t imagine life without a table between us. The table is the life raft, the center point, the home base of who we are together. That’s exactly it. So much of life was hustle-bustle, get out the door, rush in the door, do homework, clean room, get ready for bed, except for those few minutes we spent around the table. Even more so, were the moments that we spent with friends around the table sharing tacos, or broccoli cheese soup, fried chicken and mashed potatoes, or even pancakes and syrup. Those were the strings that tied my heart to that kitchen table. 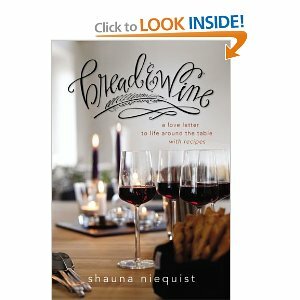 Bread and Wine: A Love Letter to Life Around the Table with Recipes also comes with recipes as the title suggests. Shauna shares her insight for when and how to create a dinner party with a emphasis on people, not the presentation. How comforting! It’s the food that everyone remembers not the beautiful centerpiece or delicately laid china settings. I loved Shauna’s down-to-earth, sweet-friend-conversation style of writing. From the first page, I wanted to be able to sit around her kitchen table and bask in the love and acceptance she so clearly offers to friends and family. Each chapter was an essay on a life event that related to food and faith, with the food mentioned becoming the end of chapter recipe. The recipes were at times “fancy” but her writing and passion makes me want to try my hand at fancy Steak au Poivre with Cognac Pan Sauce. And I also can’t wait to make her Mini Mac and Cheese side dish – a comfort food for all. There’s recipes for a simple White Chicken Chili to Mango Chicken Curry. While the recipes offer both a challenge and comfort to my culinary dreams, the simple basis of the book is what melted my book lover’s heart and re-emphasized how I’ve served my friends and family all along, for “…entertaining isn’t a sport or competition. It’s an act of love, if you let it be.” That’s the way I want to live life around my table. I pray that it always may be set first with love. Thanks Shauna for the well-written reminder. This entry was posted in Book Reviews and Recommendations, Shauna Neiquist, Women's Issues and tagged Alicia C. Hall, Alicia Hall, blogger, book recommendations, encouraging others on May 8, 2013 by aliciachall28. I enjoyed your article! I feel the same way you do about Shauna…I so badly want to sit at her table and have a real conversation with her. It’s not often I feel this kind of connection to an author…she just seems amazing! Thanks for sharing your article on the Bloom website. Blessings to you!